Unique & Vibrant Tableware. The art on these unique set of Table Mats & Coasters is taken from an original painting by Simone. Designed to add life & colour to your table, these durable polypropolene Table Mats & Coasters are heat & water resistant, and can be wiped clean with a damp cloth. The table mat measures 17″ x 11″ and the coaster is 4″ x 4″. 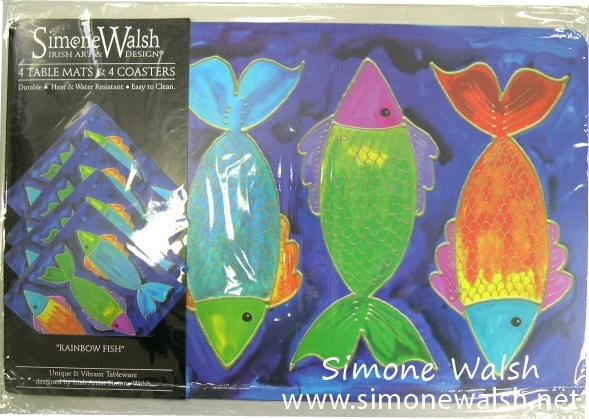 Each packaged set contains four matching table mats and four matching coasters and are €15 per set. Light weight. Non Hard backed.